We're living in turbulent, unsteady times. Terrorism, political upheaval, sin abounding, how do we as God's people respond to it all? First of all, we must realize that no political figure, no man or woman, is the answer to earth's woes. God tells us not to put our trust in man. Our trust and refuge is to be in God alone. (Psalm 118:8) Many will be deceived when a leader arises in this world bringing the nations into a time of false peace. We've got to be aware of that. The only One who will bring this world into true peace is the Prince of Peace, when He returns to rule and reign forever and ever. As God's people we must build our foundation on the truth of God's Word and be uncompromising in our obedience to it. It may not be the popular thing or the culturally correct thing to do, but it is essential to the survival of our house. It is the only way we will withstand the storms we all can sense on the horizon. Elizabeth, thank you for this reminder. God is our rock and He is the One we must trust with our lives. People will always let us down, but God will never leave us. May we trust Him and be obedient to His word in our lives. Blessings to you! Amen! Trusting Him, leaning on Him, staying firmly planted in truth and willingly obedient...so, so vital in these days! Very grateful for Christ who is our SOLID rock. The hymn is so right that our hope is built on nothing less. Yes! Standing on our Solid Rock with you, friend! Perfect timing for a topic that is personal for many and volatile depending on your beliefs. 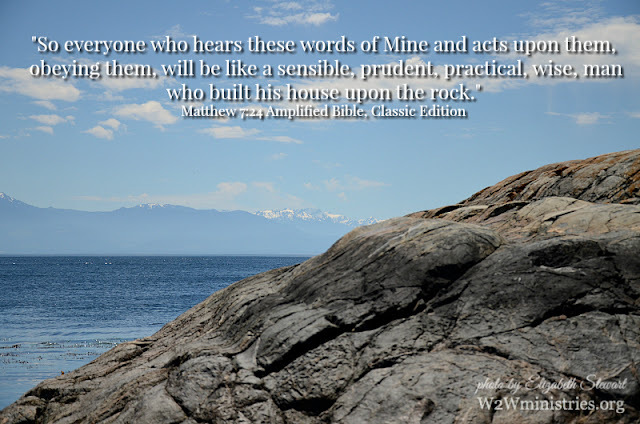 Jesus is the rock of our salvation and He is the perfect foundation for truth and hope. Mary, I'm so thankful that God is the foundation beneath our feet that is unshakeable and trustworthy in these unstable times! Great words! Thanks for the post.